Searching for a new soup recipe to satisfy my craving, led me to this unique and tasty recipe at Vital Choice. It uses salmon, my favorite fish! I really love the quality of fish, and other products at Vital Choice. I try to eat fish once a week, so I place a bulk order with them every six months. Their Sockeye Salmon Nova Lox is amazing! And their canned Albacore Tuna is the best I’ve had. They use sustainable fishing practices, and regularly test their fish for contaminants and radiation. I didn’t change much about this recipe except for reducing the serving size. 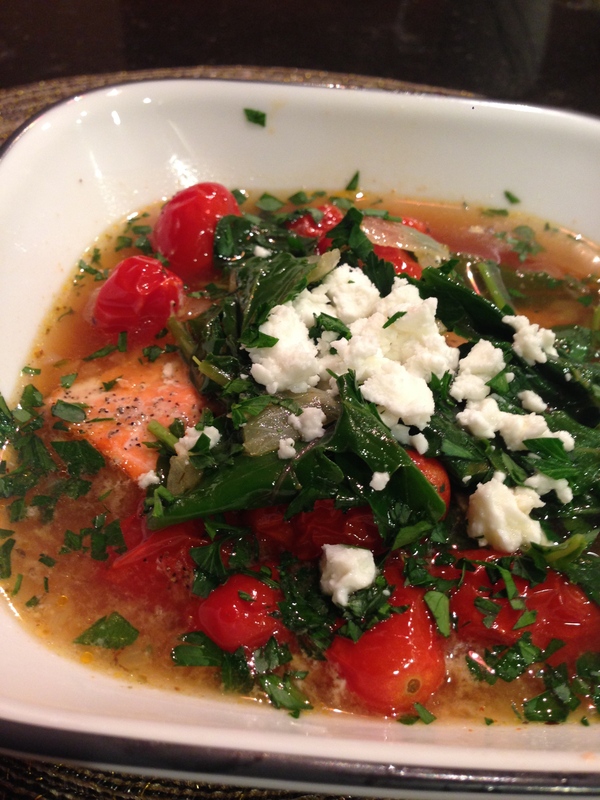 I hope you enjoy this salmon soup recipe! 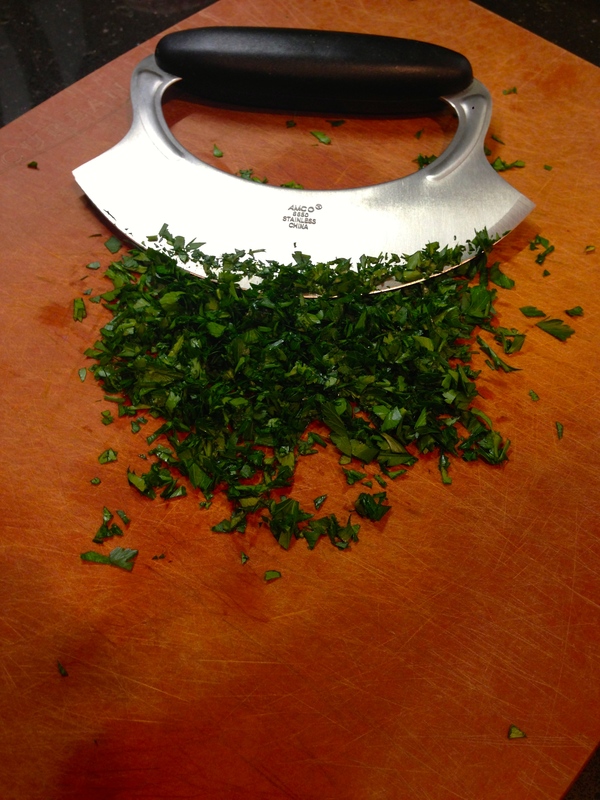 This mezzaluna is one of my favorite kitchen tools, it makes mincing things quick and easy! Line a baking sheet with parchment paper. On the baking sheet, stir together tomatoes, 1 tablespoon of the olive oil, salt and black pepper to taste. Roast in the oven for 10 minutes. Season salmon with salt and black pepper to taste. Add to baking sheet with the tomatoes and roast until fillets are opaque and flake easily with a fork, about 10 minutes. Meanwhile, in a large pot, heat the remaining 1 Tbsp of oil over medium heat. Add onion and sauté until soft, about 6 minutes. Add garlic and sauté for 1 minute. Add stock, sea salt, cayenne, oregano, and fennel seed and bring to a simmer. Add arugula and simmer, stirring occasionally until wilted, about 2 minutes. Stir in lemon juice. Taste and adjust seasoning, if needed. Arrange the whole salmon filets bowls. Top with soup. Garnish with roasted tomatoes, feta, and parsley. Categories: Dairy Free Recipes, Egg Free Recipes, Gluten Free, Paleo Friendly, Recipes, Seafood, Soups & Stews | Tags: Arugula Soup, Salmon Soup | Permalink. I also did stem cell in Frankfurt with Phil, I did in June> I always read your blog with special interest and passed it along to many other “Lymies”. I also love your recipes…..I am not good with technology though, that’s why e-mail the old fashioned way!!! I hope you’re doing well since you’re treatments! This looks really fresh and delicious. Thanks Julie, it was REALLY good!